Paul is a midwest transplant who drifted to the mountains after college and never really left. Climbing has taken Paul from the deserts of southeast California to the glaciers of central Alaska and everywhere in between. Some of Paul’s most memorable climbing experiences are the Cassin Ridge on Denali and a solo, nighttime ascent of the Hossack-McGowan on the Grand Teton. In the winter, Paul enjoys skiing and ice climbing throughout the Greater Yellowstone Ecosystem. His most memorable descent was skiing the Grand Teton in boot-top powder, and his favorite run is the Do-Its on Teton Pass. In addition to guiding year-round for Jackson Hole Mountain Guides, Paul is our Avalanche Program Coordinator and Colorado Branch Manager. 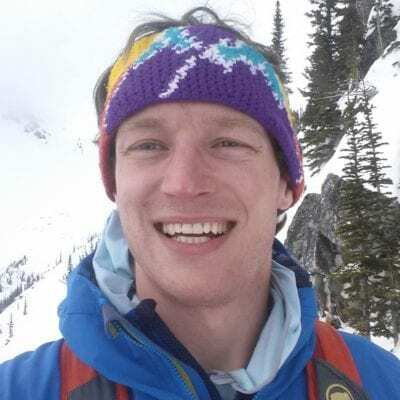 He is an AMGA/IFMGA Mountain Guide and has completed a Level III Avalanche Course through the American Avalanche Institute. Our experience with using JHMG a second year in a row was awesome. It could not have been any better than it was. The hiking pace that Paul set going in the first day was perfect for having to climb over 4,000 feet during the 8 mile hike. As usual, Paul spoiled us with his food selections and cooking. His ability to determine our strengths and weaknesses are outstanding which were crucial for a successful summit of Granite Peak. Paul was an outstanding guide (I have a strong frame of reference; I have probably worked with at least 20 guides on five continents). He guided me and my two young children on the Grand Teton. Paul was patient and firm with them. They felt safe and I felt they were in good hands. Most importantly, Paul seemed invested in our achieving our objective for the trip. It never felt like just a job to him. I just climbed the Grand Teton with three amazing guides from JHMG. Nate, Paul and Jacob have years of experience mountaineering, and their professionalism and ability is second to none. I would climb with any of them again, without hesitation. I thought all three of our guides, Nate, Paul and Jacob were extremely professional, very patient and took the time to get to know us. They were informative on the actual climb and expectations. I enjoyed the experience and would feel comfortable recommending and choosing JHMG again. I also wanted to give a shout-out to Mark and Patrick in the office who helped to coordinate everything on the front-end for me. They did an awesome job! !